iradiophilly | News - Loves Local Music - Philadelphia Local Music Day is Here! Saturday May 12th! Loves Local Music "is an advocacy organization dedicated to promoting the diverse music scene that Philadelphia continues to foster." That's from the Loves Local Music statement started by Philly native Monika Julien. 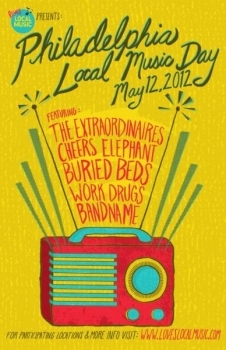 Saturday, May 12, 2012, Loves Local Music will be presenting the first Philadelphia Local Music Day! On Philadelphia Local Music Day, local businesses will be playing recordings of five featured local musicians for one full workday, giving these artists the opportunity to reach new audiences in an alternative setting. Philadelphia Local Music Day aims to bring more awareness to Philadelphia’s vibrant, talented arts community while encouraging Philadelphians to support the city’s local culture and economy. This day's featured artists include Cheers Elephant, Bandname, Work Drugs, Buried Beds, and The Extaordinaires. You can download a sampler of all the bands playing today here. You can hear each of those featured artists playing right now on Rift . We jumped the gun and started already... ha! iradiophilly also has a station dedicated to Local Artists called BYO . Local bands and artists are encouraged to submit your music to be included for airplay on BYO. This year's participating locations include: The Rocket Cat Cafe, Honey's Sit N' Eat, Repo Rcords, Art in the Age, Federal Donuts, The Lola Bean, Smak Parlour, Johnny Brenda's, Green Isle Grocery, Ultimo Coffee Bar, Trophy Bikes North, The Abbaye, Honest Tom's Taco Shop, The Marvelous! Music.